It’s true that when women talk with each other, change follows. We may change our attitudes, our surroundings, the people we hang around with, the world. Serious or funny, big or small, communication effects change. Things happen and new chapters are written in our lives. Hi, I’m Nadia Giordana. I’m an author, publisher, producer, and cable TV host. I strive to inspire women of all ages to reactivate sidelined dreams and reinvent new chapters in their lives. One of the best ways I can do this is to spotlight the accomplishments of other inspiring women on my television shows. I also offer a platform for writers and artists (men and women) to see their work published–some of them for the first time. I encourage you to think of your best life as a book with you as the author, and ask yourself, What chapters are yet to be written? Nadia serves as host/co-host, producer and social media director on these other TV shows and also publisher/editor of WINK: Writers in the Know magazine: If you are hoping to be a guest on one of the shows, or to submit written material to the magazine, please start by visiting the websites and liking the Facebook pages. That’s Odd: (Nadia co-hosts and produces) TOTV Prime Directive: To seek out life’s little desserts, slices of the lighter side, mini escapes from reality and things that make you say, oh! Click here to see one of our recent shows. 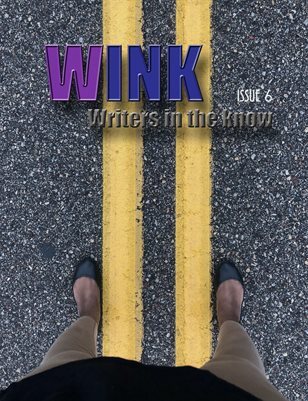 WINK: Writers in the Know is a print literary magazine with a digital companion dedicated to showcasing creative writers, artists and photographers from around the world, both emerging and established. Click here to see a recent TV show appearance where Lynn and I were able to share info about WINK. QC Cooks is a program Nadia hosts and co-produces with QCTV serving the Minnesota quad-city communities of Champlin, Anoka, Andover and Ramsey. Click here to see episodes. Nadia Giordana is the author of three books, Thinking Skinny, Reinventing New Chapters in Your Life at Any Age, and No Thank You, I’d Rather Be Myself. She is a mentor, motivator, speaker, and community TV producer and host. At age 59 in 2007, she decided it was time to lose the 80+ extra pounds that she felt were weighing her down. She did it naturally and quickly, using a sensible plan she designed for herself. Her most popular book, Thinking Skinny, chronicles that journey. The second thing Nadia did was overcome a lifelong fear of public speaking. That accomplishment sparked her passion for working in community television projects with an emphasis on promoting other women who are living the second acts of their lives. My brand: Shift, change, and ultimately, transformation. Whatever your age, it’s not too late to shake off negative self-talk and reinvent new chapters in your life. My Mission: To help women in midlife find the inspiration to reawaken sidelined dreams and create new chapters in their lives. My advice: It’s time to do the things you’ve always said you were going to do, or replace outdated dreams with better ones–and follow through! I’m not talking about a bucket list to mark off items one by one saying, “There, I did that.” I’m talking about living. Update: In the context of my blog posts and interviews, I will inform my audience whether or not I have received goods or services from the person or company being featured. As a rule of thumb: in almost all cases, I will have read the book by an author I am interviewing (and that author will have provided me with a copy for that purpose). In the case of teachers, life coaches and business owners that provide a range of services, I can tell you that I will (in almost all cases) not have received the services we are discussing (if there is an exception, I will let readers know). But bear in mind, I am not reviewing these products, nor am I recommending them. I am interviewing people about their accomplishments and contributions. Nadia Giordana’s other website: Thinking Skinny LLC. She is an active blogger and is currently conducting selected interviews for her TV show, Where Women Talk, and she is also granting personal interviews about her own books, THINKING SKINNY and Reinventing New Chapters in Your Life at Any Age. Another of Nadia’s publishing projects, is the three-volume documentary journal, 10,000 Days In Alaska by Norman Wilkins. Are there other books and/or creative projects on the horizon? Yes.